Roselle Baliton and the Lady Warriors score their third win in 12 matches. UNIVERSITY of the East scored its third win of the season, while sending Adamson University to its eighth consecutive loss, 25-14, 25-19, 25-22, on Saturday in UAAP Season 81 women’s volleyball tournament at the Smart Araneta Coliseum. The Lady Red Warriors scored three wins in a season for the first time since Season 74, where they finished with a 4-10 win-loss record. UE celebrated as rookie coach Karl Dimaculangan and the Lady Red Warriors improved their record to 3-9, out of the semifinal picture but showing signs of improvement. Mean Mendrez led the Lady Warriors with 15 points off 11 attacks, three service aces and a block. Skipper Roselle Baliton put up six blocks and finished with 14 points, while Judith Abil had 11 markers including 19 excellent receptions and 18 digs. “Sobrang saya kasi galing sa mababang standing tapos nag struggle din kami, yung mga dating games sayang din,“ said Baliton, who delivered the match-clinching block on Adamson rookie Trisha Genesis. 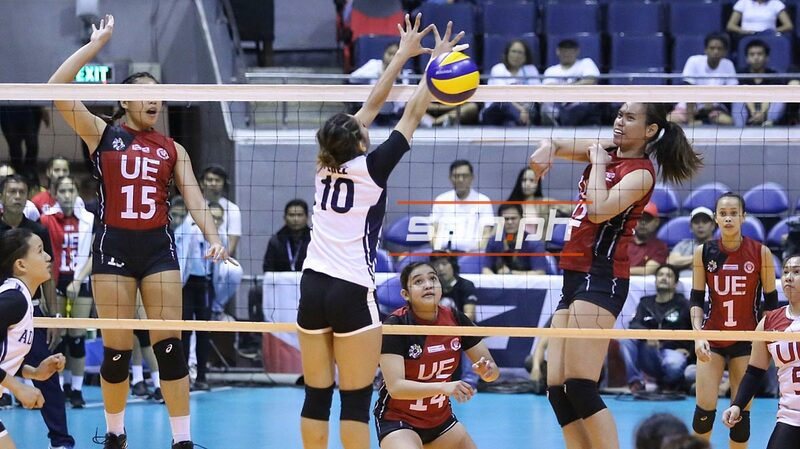 League-leading setter Laiza Bendong had 24 excellent sets and four aces, while libero Kath Arado who had 33 digs. UE will face La Salle (8-3) after the Holy week break on April 24 at the Arena in San Juan. Bern Flora led the Lady Falcons with 10 points, 15 digs and 15 excellent receptions. Adamson closes out its season against Ateneo (10-1) on April 24.